If you’re a news addict, the last ten days or so were probably a dream come true. It’s hard to know where to start, but I will limit myself to just four stories … but they’re four big ones. And as Bastiat suggested, we will try to look beyond what we can see to probe the deeper implications in what may be unseen. China’s stock market lost a year’s worth of momentum – there is a breathtaking crash going on. Puerto Rico’s governor says the US territory can’t pay its $72 billion in debt. This is one of the most irrational debt stories, and I try to offer some actual mathematical analysis of how it came about. Greece is holding a referendum on Europe’s latest bailout offer. What political genius designs a referendum where, no matter how the vote turns out, everyone loses? We Americans are celebrating our Independence Day this weekend. The news our ancestors read on this day in 1776 wasn’t so great – but the US survived its rough start. China, Puerto Rico, and Greece will survive, too. But the decisions their government make, just like the ones our fledgling government made all those years ago, will make a great deal of difference. Let’s get past the gloom and doom to see if we can find some good news. Yesterday’s employment report can charitably be described as so-so. Some 223,000 new jobs were added last month, all of them in the private sector. That number has to be balanced with losing 60,000 jobs over the last two months through negative revisions. As I have often discussed, the employment number is subject to a great deal of revision in later months and years. Perhaps more important to watch than the actual number is the trend of the revisions. If the revisions are positive, that means more jobs are bubbling up from beneath the surface of the survey, and that is a good thing. If the trend of the revisions is down, which it typically is for quite some time before a recession ensues, that’s not so good. For the previous three months (March, April, May), the average number of jobs created was 187,000; but for the three months before that (December, January, February), the average was 265,000 jobs; so we’re in a clear downward trend. Recently, many of the new jobs have been in low-paying sectors (bars and restaurants being particularly good places to find work), and the trends for average pay and hours worked have been flattish. From the standpoint of the average worker, the trend is pretty disappointing. The unemployment rate fell two-tenths to 5.3% – a level that the FOMC didn’t expect to be reached until later this year – though the decline reflected an outsized drop in the labor force participation rate, so the drop is not for a good reason. But it does demonstrate that labor slack is decreasing. And while that might seem an “inside baseball” type of statistic, we have to remember that Janet Yellen is a labor market specialist, and she really pays attention to this metric. She and the rest of the FOMC do not want to get to what is called the NAIRU (nonaccelerating inflation rate of unemployment, which is the level of unemployment below which inflation rises) until they are well into the process of raising rates. Former Fed Governor Larry Meyer is reiterating his call for a September rate hike. He is joined by a number of members of the FOMC, who think we should have been raising rates a long time ago. (For what it’s worth – and it’s not worth much – if I were on the FOMC, I would want to be raising rates as well.) The consensus of the committee is that the Fed rate will be at 1.75% (up from today’s 0.1%) by the end of 2016. Trying to discern what the Federal Reserve will do by reading the committee’s minutes is a fraught proposition. Back in March 2004, three months before the Fed’s initial rate hike, the FOMC said in their minutes that “With inflation quite low and resource use slack, the committee believes that it can be patient in removing its policy accommodation.” Does that sound to you like they were getting ready to raise rates? Or that they would be raising rates for 17 consecutive meetings thereafter? It has been nine years since the Federal Reserve last raised interest rates. It is difficult for me to see how even a 1% interest rate could not be seen as remarkably accommodative. As an anecdotal aside, I had dinner with some of the usual suspects Wednesday night: Art Cashin, Barry Ritholtz, Rich Yamarone (Bloomberg chief econ), Dan Greenspan (BTIG econ), Lakshman Achuthan (ECRI forecaster and business cycle expert), and a hedgie who prefers to remain anonymous. In short, a relatively clued-in, on-top-of-the-data group. Art asked a very simple question, “Will the Fed raise rates this year?” Not, when will they start, but just, will they do it this year? Of course, with this crowd, everybody had to talk about when they will start as well. To say there was no consensus would be an understatement. I don’t think any two people agreed on whether and when the Fed will raise rates. Barry thinks they will raise rates every other meeting until they reach 2%. Dan is firmly in the camp that they will raise rates this year and sooner rather than later. Several questioned how the Fed could possibly raise rates with the economy being so close to stall speed. As for me, I sense that the Fed feels the need to raise rates but is going to do it more slowly than any of us expect, perhaps by only 1/8 of 1% per meeting, in an effort not to overwhelm market expectations. Interestingly, the hedgie in the group seems to think the potential for all hell breaking loose in the middle of September is significant. The pushback he got from the rest of the table was interesting. I would just observe that he has a rather significant amount of money in play, as opposed to the rest of us. Bottom line: you can read into this latest employment report whatever you want. You can look at all the minutes and the speeches and see whatever you want to see. Janet Yellen knows she has to begin to raise rates now – if for no other reason than that she wants to be able to lower rates in response to some future recession. If we have a Federal Reserve managing interest rates for short-term results, then we are in a great deal of trouble. Now let’s scan the international landscape for further evidence of the unseen. 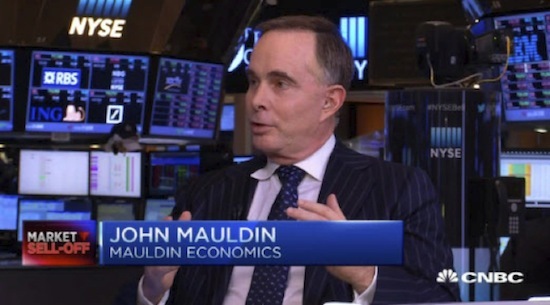 Bill Griffeth and Kelly Evans were kind enough to invite me on “Closing Bell” to talk about China, where I shamelessly worked in a plug for my new book, A Great Leap Forward? I told them that the current pain is really a result of both Beijing’s grand plan and part and parcel of the unique Chinese cultural phenomenon. As I’ve written about in previous letters, China is now at a long-foreseen point in their development where they have to shift away from the previous top-down command economy and let markets function more organically. Inevitably, this transition is causing pain for people accustomed to the old ways. President Xi Jinping has to manage the pain and maintain order, but, as they say, “No pain, no gain.” Xi is very astutely framing the whole reform process as a crackdown on corruption. I suppose that’s what it is, in a way, but now that he has begun, he has to stick with it. With regard to the markets, Xi has the advantage of knowing what Xi will do next; the rest of us don’t. The government lets markets do as they will up to some point the leadership must have defined, takes charge again, and then steps back to watch. I suspect their intent is to intervene less and less frequently as the grand plan unfolds. Last weekend, in the most recent intervention, the PBOC cut interest rates and reserve requirements. This was a dramatic move, but with the Shanghai Composite down 20% in two weeks, they must have wanted to make a splash. If so, it didn’t work. 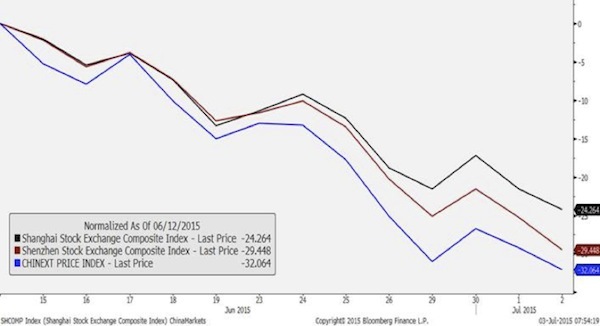 Chinese stocks fell another 3% or so on Monday and another 5 to 6% since then. Western traders sniffed panic and headed for the exits. This development points us to another emerging Chinese phenomenon. It’s critically important, but people aren’t seeing it. China’s fast-growing middle class absolutely loves playing the stock market. Chinese families are opening accounts and borrowing money to trade on margin at an astonishing pace. Check out these Goldman Sachs charts, courtesy of Ed Harrison at CreditWritedowns.com. The Chinese, as a broad generalization, don’t invest with the same perspective that Western investors do. Chinese individual investors are not primarily “value” investors. Sky-high valuations don’t seem to faze them. They are primarily momentum investors who buy whatever is moving and sell whatever is falling. 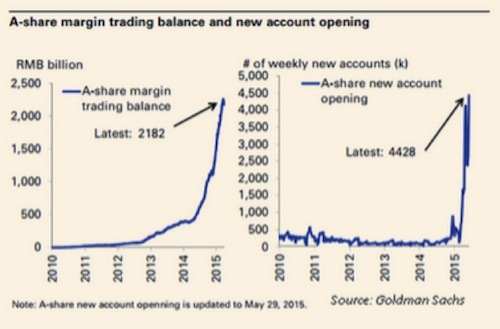 The number of new Chinese trading accounts went vertical this year. Further, many of the world’s largest index funds are either adding China to their indexes or increasing their exposure, resulting in a tidal wave of Chinese stock buying. That’s what made China indexes double and some individual stocks triple and quadruple. It’s breathtaking to watch. I expect more volatility from China in the second half of this year and, really, for years to come. If you want to know why, read (from our book) Louis-Vincent Gave’s chapter, “The Importance of RMB Internationalization,” which I ran in Outside the Box last month. Beijing gave the world another little tease last week, too. According to Bloomberg, the Ministry of Finance posted draft regulations that would allow one of the nation’s largest pension funds to buy stocks. Between that and the renminbi opening that Louis Gave expects, Chinese stocks still have plenty of fuel to move higher – but I think the volatility is going to astonish us. Would I invest in China right now – today? As a trade? Probably not – at least until we see more signs of a bottom and Chinese buyers piling in again. China is a trader’s market right now and will be for some time. The best you can do: follow the momentum and get out quickly when it starts to fade. Yes, I think that longer-term, China is going to be a fabulous market, but most people are just not going to be able to handle the volatility. Will China’s economy keep growing at 7% a year or more? No – even Xi can’t sustain those growth rates. He can probably manage 3–4% a year, though, after the economy normalizes. In a country as big as China, that is still mind-boggling growth. Wouldn’t we love to be able to get back to 3 to 4% growth in the US? There is a lot of money still waiting to jump into somebody’s wallet. The last few weeks notwithstanding, China is still a land of investment opportunity. China is perhaps one of the most important question marks in the economic world today, and so it can’t help but matter to your investments. The mainstream media is focused on Greece, but the reality is that Greece is a sideshow compared to China. Quick shameless plug for our e-book, A Great Leap Forward? Worth Wray and I asked some of the world’s top China experts to decode the future for us. They answered in spades. It’s a fantastic book for anyone interested in China. For now it’s available only in electronic form. Go here to learn more, read some excerpts, and order from your preferred e-bookstore. Next trouble spot: Puerto Rico. Sunday the Commonwealth acknowledged that it can’t keep up payments on its $72 billion debt, something that many of us have known for some time. At this point, Puerto Rico’s debt is approximately 15 times larger than the per capita median debt of the 50 US states. And Puerto Rico is dramatically poorer than the 50 states. Forty percent of the population lives below the poverty line, and the Puerto Rican economy has been in recession for nine years! Another factor is that government aid can provide Puerto Rico residents with $1,743 per month in benefits, compared with the average take-home earnings on the island of $1,159 per month for a minimum-wage worker. That imbalance can act to discourage people from seeking work. The unemployment rate in Puerto Rico stood at 12.4 percent in May, or more than double that of the US. Puerto Rico is a tiny island of 3.6 million people. They carry an average of about $20,000 of debt per man, woman, and child. At the 8% yield that Puerto Rico currently pays, that is about $200 per month per person just in interest costs. That comes to $10,000 a year for a family of four. And that’s before the government pays anything for healthcare, education, police, fire, pensions, etc., etc. It’s simply not a sustainable business model. Complicating the situation is the fact that Puerto Rico cannot declare bankruptcy the way US cities and municipalities can, and there is no impetus in either Congress or the White House to bail out Puerto Rico. That being said, nearly all of the $72 billion that Puerto Rico owes is owed to US institutions and funds. While that debt is not going to zero, a lot of municipal bond funds are going to take a hit on their holdings. Presumably the vast majority of funds are diversified, but it won’t be a good day at the office when Puerto Rico starts offering to give haircuts. The New York Times “broke” the story that everyone online already knew, with an interview they had done a few days earlier. Here is their lead. The debt is not payable,” Mr. García Padilla said. “There is no other option. I would love to have an easier option. This is not politics, this is math. We talked about the public pension problem in Illinois two weeks ago. That situation still looks dire, but Puerto Rico appears more urgent and is not a much smaller problem. Give Gov. García Padilla applause for his candor. I wish mainland politicians would speak so directly. Puerto Rico is rapidly running out of cash. Of course, there are always options, but none that don’t involve a haircut of some kind for creditors. Neither Puerto Rico nor Illinois can declare bankruptcy under current US law. Puerto Rico apparently plans to play hardball with its creditors. Of course buyers piled into these bonds, attracted by the discounted price and high yield (although the yield was not nearly high enough for the risk involved). One firm (that will go unnamed to protect the innocent) even opened a special fund for its investors to get in on the fun; the same firm, along with others, now claims that it owns other insured Puerto Rican bonds and will be protected from losses when the default comes. The market is not so sanguine: shares of bond insurers Assured Guaranty Ltd. (AGO), MBIA Inc. (MBI) and Ambac Financial Group, Inc. (AMBC) were down 13.35%, 23.40% and 11.89%, respectively, after the governor’s comments on June 29. MBIA and Ambac insured roughly one-fifth or between $14.0 and $15.0 billion of Puerto Rican bonds. According to BTIG analyst Mark Palmer, Ambac faces potential losses of $4.5 billion while MBIA is looking at a $4.9 billion hit, which suggests that the insurance may not be there when needed or that the insurers will suffer losses that will materially damage their capital bases, credit ratings and ability to keep writing business. Moreover, like any insurance company, bondholders can be certain that these companies will do everything legally possible to avoid or delay paying these claims. Since there are restrictions on Puerto Rico’s ability to file for bankruptcy and other complications in this situation, an immediate insurance payout upon a payment default is highly unlikely. Glibly depending on the kindness of bond insurers is likely to prove to be a fool’s game. So what good news could possibly hide in all this? Economically, Puerto Rico looks a lot more like Greece than like a part of the United States. Per-capital income is low; unemployment is high; and the government has no money. As the US Treasury Department continues to tighten its noose around offshore accounts, a new tax haven has sprung up under its nose in the Caribbean. Welcome to Puerto Rico–island of tropical breezes, and (for new arrivals only) a 0% tax rate on certain dividends, interest and capital gains. Yes, this is legal. While the U.S. asserts a sweeping right to tax citizens’ income wherever they live and wherever it’s earned, Section 933 of the tax code exempts residents of Puerto Rico from paying US income tax on their Puerto Rico-sourced income. Instead, the Commonwealth of Puerto Rico has the exclusive right to tax local income as it sees fit. “The way the US tax code is written, I could be on Mars and be taxed on intergalactic income but not if I’m sitting on this island in the Caribbean. It’s kind of in a twilight zone,” marvels Irvine, Calif. money manager Mohnish Pabrai. To exploit this special status and help rescue its economy, Puerto Rico’s Legislative Assembly adopted two laws in 2012 and expanded them last year. Act 20 entices hedge funds, family offices, professional service firms and even software developers to locate there by taxing their corporate profits from exported services at a flat 4% rate and allowing those profits to be paid out to the owners free of Puerto Rico income tax. So far the government has okayed 346 export companies, with 400 approvals expected this year. Act 22 grants new Puerto Rico residents (including, after a recent amendment, returning Puerto Ricans who left before 2006) a 0% rate on locally sourced interest and dividends as well as all capital gains accrued after they become residents, a particular benefit for active traders. So far 509 tax refugees have been granted Act 22 status and another 600 will get it this year, Puerto Rico’s Department of Economic Development & Commerce projects. As you might expect, this tax bonanza is attracting some serious wealth to Puerto Rico. It is a potential choice if your business doesn’t depend on being physically present in New York or Chicago. Puerto Rico has modern internet and phone service and is only one time zone away from the East Coast. I have personally been approached by three different people trying to get me to move to Puerto Rico, extolling the incredible tax benefits. I know of a half a dozen individuals and businesses that have moved in the last 12 months. However, while Puerto Rico is a lovely island, there is this pesky rule that comes along with the tax benefits that says you have to live outside of the US for six months plus one day every year, which is something that for the vast majority of us simply won’t work. This will be an interesting experiment if nothing else. In theory, Puerto Rico has all the ingredients to become the Singapore of the Caribbean. The tax breaks should attract a critical mass of talented, entrepreneurial people with capital to invest. If they can double or triple the local economy, Puerto Rico’s debt will start to look a lot more manageable. I don’t know if they can do that. I don’t think it will work if the newer, wealthier residents simply set up shop in their fortified enclaves. The growth needs to trickle down far more rapidly to the native-born Puerto Ricans than we see happening today, in order to create a true growth dynamic. We’ll see what happens. If you hate paying taxes, then forget about muni bonds and go on a house-shopping vacation to San Juan. We’ll come back in about 20 or 30 years and see if tax incentives were enough to push Puerto Rico over the top. Finally, we come to Greece. The situation there looked dire when I sent last week’s letter, and it hasn’t gotten better. The country failed to make an IMF payment that was due June 30. Greek banks are all closed and are rationing cash withdrawals. The Athens Stock Exchange was offline all week. The ECB clamped down on emergency loans to the Bank of Greece, so the country’s entire financial system is on the brink of collapse. The next big decision point is the Greek popular referendum that Prime Minister Tsipras unexpectedly called for Sunday, July 5. This referendum is another odd twist. Greeks will vote yes or no on accepting the European bailout offer that expired on June 30. Tsipras and most of his Syriza party are urging a no vote. If they get it, Tsipras will go back to the creditors and demand new negotiations, with the nation behind him. I doubt that popular support will sway Germany or the rest of Europe. Seriously, when your teenage daughter stamps her foot and demands that you give her back the credit card after she runs up a monster bill, you’re not really inclined to relent. And while that’s not the way the Greeks see it, ask the average German voter. If Greeks vote yes on the referendum, they still won’t get the bailout, because it expired and the Eurogroup nations refused to extend it. A “yes” outcome will more than likely force Tsipras to resign and make way for another government. Even under the best-case scenario, which includes growth of 4% a year for the next five years, Greece’s debt levels will drop to only 124%, by 2022. The best case also anticipates €15bn (£10bn) in proceeds from privatisations, five times the estimate in the most likely scenario. I don’t mean to be trite, but unpayable debts are debts that won’t be paid. Greece’s creditors know this, yet they still demand payment. Why demand something you know you won’t get? The only reason is that you have some other unspoken objective. As a financial matter, it seems likely the creditors will have to take huge haircuts and Greece will enter an extended depression, either with or without the euro. The ECB has been gaming Greece for some time. Reports suggest they think they have Greece ring-fenced such that it won’t set off a market contagion. I wrote five years ago that Europe (read Germany) would be willing to let Greece go as soon as European (read German) banks had gotten rid of most of their Greek debt. That Greek debt is now largely on the books of state actors (governments, the IMF, and central banks) who will just absorb the losses and pass them on to their loyal taxpayers. Liberia? Really? Liberia? We can understand Turkey; and we can understand Romania and Cyprus having reasonable exposures, but the modest sums involving the US and Germany rather surprised us. But again, Liberia? Haven’t they enough problems at home with Ebola and corruption? Have Liberia’s banks really had to go abroad and to Greece of all places? Again, sometimes you cannot make this stuff up. I understand that the ECB and the European Commission have to be making contingency plans in case Greece leaves the euro. They need to deal with potential bank runs in other countries, especially the smaller countries near Greece (for countries with potential problems, see the list above of Greek debt holders), and to protect all markets from the negative consequences of a possible Grexit. They would be derelict in their duties if they were not making contingency plans. But to call those contingency plans Operation Albani? Seriously? At this point I actually have no idea how to handicap the results. In my family circle, for example, there exists quite a split. My cousins, and their friends, who are all in their 30s/40s, will firmly vote in the NO camp. But many of them are not actually voting because they must travel to their birth village to cast a ballot. Most of them do not have money to travel. [Really?!?!? This is the cradle of democracy? Who still has these rules?] My uncles, aunts and their friends are split. The YES voters are doing it purely for pension money, not because of some allegiance to Europe or a strong austerian/reformist political view. The NO voters are casting a ballot with their heart not their wallet. Of course, the views on the islands where my family reside are far more left leaning than in Athens. But I do not think one can generalize too much geographically as we head into Sunday. Even the people in Athens seemed more skewed to NO than I would have thou ght. The NO rally had 35,000 participants and the YES rally had only 5000. 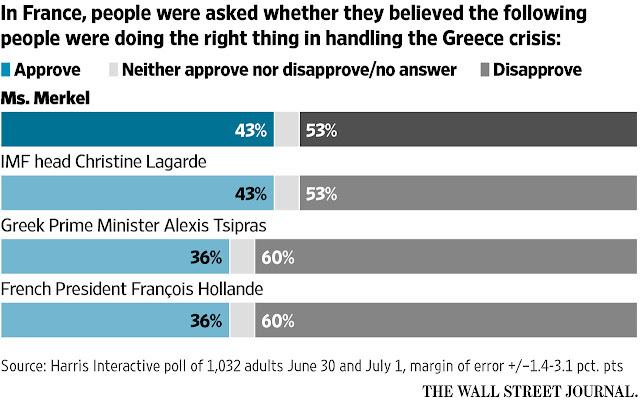 This will be a very complicated vote for the Greek people. And whether it's YES or NO, the situation in Greece will be terrible for years to come. Many nasty forces across ALL of Europe have led us to this crucial point. And to be sure, turning any Eurozone nation into Albania is nothing to be proud of. It will unfortunately mark one of the largest European failures in the last 70 years. On the other hand, the Greek islands make for a marvelous vacation, and Athens is a phenomenal cultural attraction. There may be no better time to start planning your next Greek vacation. You can save a little money and do your bit to help the Greek economy. I’m in New York for one more week before I return to Dallas. Then I get one night in my own bed before I fly to Denver for the Inside Alternatives conference for investment advisors and brokers. My friend Larry Kudlow will be delivering the other keynote. I will be there on behalf of my good friends at Altegris Investments and am looking forward to being with Jack Rivkin, whom I should congratulate for being named their new chief executive officer. Jack has a storied history on Wall Street, where he ended up running Neuberger Berman and being responsible for much of the success there. He retired but never really quit working, and now at 75 is ready to go build something else. His energy and enthusiasm are inspirational to me. I look forward to getting to spend a long Sunday evening with Jack, going over investments but also sharing our mutual fascination with future technology. Jack is on the board of Idealab and has been an influential venture capitalist involved with many startups. He is the one who introduced me to the brainwave training I’ve been undergoing here in NYC. He is further down the road with it and raves about it. I look forward to being able to write about it sometime soon and tell you about my experience with it. It is coming to a future near you. The first week of August will see me for one or two nights in New York before I go on to Grand Lake Stream, Maine, for the annual economist fishing event that is known alternatively as Camp Kotok (after David Kotok of Cumberland Advisors, who organized the first gathering, many years ago) or, as some of the press have called it, the Shadow Fed. I bet we have more fun than they do at Fed meetings. And we certainly do less damage. Later in the month I will return to New York City for a few days before going on to Gloucester and Boston for a few days of vacation with friends. Then I’ll spend a few more days on the East Coast before returning home. My friend Doug Kass was reminiscing yesterday about his youth – before he became a famous investment guru – when he was actually a Deadhead, traveling around digging one Grateful Dead concert after another. He was musing about the fact that the Dead are now on their final tour, called the “Fare Thee Well Tour.” And then he realized it had been “only” 50 years ago that they gave their first concert. But then it happened again at the dinner I mentioned at the beginning of the letter. It was either Barry or Rich who brought up a reference to The Odd Couple. I know that Dan Greenhaus is young, but he was looking around at the rest of us chuckling, and he clearly didn’t get it. Barry looked at him and said, “You know, the Odd Couple. Oscar and Felix.” There was still that blank look. “The ’70s sitcom on TV. Surely you’ve seen it once or twice,” I offered, trying to be helpful and believing that surely he had at least seen the movie. He had no clue. I will be 66 in a few months, and I find that more and more of my clever cultural references and witty repartee simply go over the heads of my audience. Truly, what a long strange trip it has been. I have to say that mine has been fun and seems to get more exciting and interesting every year; but guys, really, teach your children well. Or something to that effect. Have a great week. I’ve been invited by my friend Murat Köprülü to watch the fireworks from the roof of the new Whitney Museum. The Whitney had actually been one of the things I wanted to see what I was in town, and so now I get to watch the fireworks from possibly one of the best vantage points in New York and see the art as well. What a great way to spend July 4. I hope there are a few fireworks in your world as well. BRUSSELS—Eurozone leaders set Greece a Sunday deadline to come up with new and even-tougher economic measures if the country wants to avoid defaulting on the European Central Bank and crashing out of the currency union. As a sweetener for such a deal, leaders raised the possibility of some short-term financing to help Athens make a July 20 payment and—most important for Greek Prime Minister Alexis Tsipras—action down the road to relieve Greece’s crushing debt burden. Obstacles to an agreement that keeps Greece in the eurozone remain high, however. Most notably, the policy overhauls and budget cuts demanded go beyond those that were resoundingly rejected by Greek voters in a referendum last weekend. German Chancellor Angela Merkel said after Tuesday’s emergency summit of eurozone leaders that it is up to Greece to act. “Of course, at the very end, one will have to discuss how debt sustainability can be recreated but not by saying first ‘How do we close the gap?’ but “What can Greece do?’ ” she said. She added that Mario Draghi, the ECB president, made clear to leaders at the summit that Sunday would be “the right moment to take decisions” for Greece to avoid a meltdown of its banking system. Mr. Tsipras said that the negotiation process would be fast. “I believe there will be a solution by the end of the week at the latest,” he said. Leaders said that the broad outlines of such an agreement needed to be nailed down at a new summit on Sunday of the leaders from the entire European Union, including nine countries that aren’t in the eurozone. Without some new cash in the coming weeks, Greece won’t be able to make the €3.5 billion ($3.8 billion) bond payment to the ECB, leading to the country’s second default in less than a month. Such a nonpayment could push the ECB to cut emergency lending to Greek banks—a move that would send the country’s financial system into meltdown and force the government to print its own money to recapitalize them. Greek banks have been shut for more than a week, after the ECB put a limit on the emergency loans they had been drawing to buffer growing deposit outflows. Cash withdrawals from ATMs have been limited to €60 a day and depositors are unable to transfer money abroad. Some short-term funding and the prospect of a longer-term bailout deal from the rest of the eurozone could allow Greece—and the ECB—to let banks reopen and normal economic activity in the country to resume. Getting there, however, would require a formidable turnaround by Mr. Tsipras and his government. In addition to the pension cuts and tax increases, rejected in the referendum, a new rescue package to keep the government afloat for two to three years would require overhaul measures that had dropped out of negotiations in recent months. These, Ms. Merkel said, include changes to labor laws to make it easier to fire workers, changes to product markets and the privatization of state assets. “This isn’t about a program from today, or from yesterday or from 10 days ago, for a program until November…this program is, according to the now-withdrawn Greek request, meant to be two years long, so it is a multiyear program,” Ms. Merkel said. “That such a multiyear program has to entail more commitments is in itself clear,” she added. Only once that is clear, leaders would look at ways to make Greece’s debt sustainable again, Ms. Merkel said, adding that any debt relief wouldn’t include cuts to the nominal value of rescue loans. But talks on details of a final plan could drag on for weeks. A senior French official pushed the idea that Greece could get emergency financing by passing just the budget measures of a potential agreement through the Greek parliament, and passing non-budgetary, more structural changes later. But Germany may not accept that. Emboldened by Sunday’s referendum, Mr. Tsipras came to Brussels to present his eurozone counterparts a proposal for interim financing until the end of the month, a senior Greek government official said. That would give Greece and its creditors time to work out a longer-term financing deal and avoid defaulting on the ECB. Mr. Tsipras was hoping to use the leverage from his referendum victory to win enough of a political nudge from the summit that would allow the ECB to keep its lifeline in place. He raised the idea of interim financing with Ms. Merkel, Mr. Hollande and Jean-Claude Juncker, head of the European Union’s executive Commission, ahead of the summit, the Greek official said. 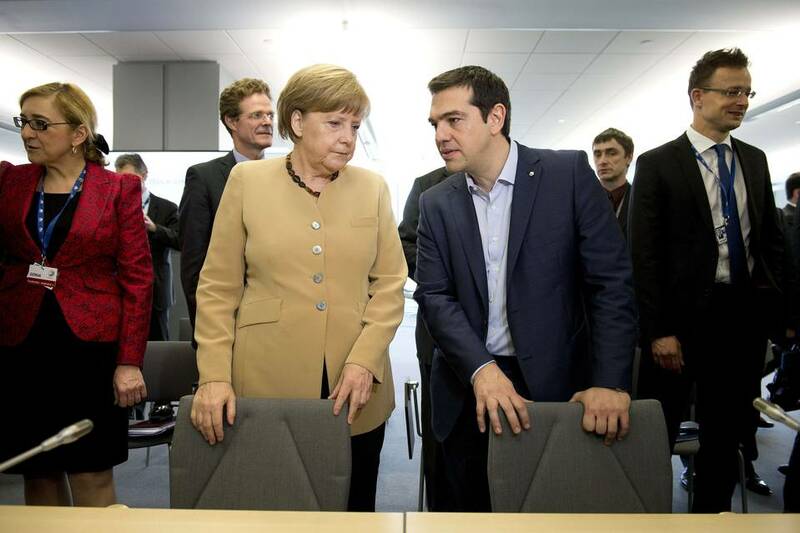 Whether the new reform commitments from Mr. Tsipras were credible “I can’t say today.” Ms. Merkel said later. At a meeting of finance ministers earlier Tuesday, Greece’s new finance chief, Euclid Tsakalotos, read out proposals the government had presented last week, three European officials said. But the new finance minister’s performance raised some hopes among ministers that things had changed. “The minister Tsakalotos came for the first time in this meeting and he adopted clearly a constructive, moderate listening mode, which I think was appreciated by all the colleagues,” Pierre Moscovici, the EU’s economics commissioner said. The International Monetary Fund, which Greece technically defaulted on last month, has said “comprehensive” debt relief should be included in any further bailout. But divisions still run deep in Europe. Leaders warned Tuesday that failure to strike a deal could catapult Greece outside the common currency. “We have a Grexit scenario prepared in detail,” said Mr. Juncker. Like a falling barometer, sliding commodity prices can often signal an approaching storm for investors. The contagion from the crisis in Greece and the crash in China to other major securities markets so far has been relatively muted. The far greater impact appears to be in commodities, which have fallen hard this week. Losses have been across the board, from crude oil to corn. And while there hasn’t been any single, strong linkage from the commodity pits to the tumult in Athens and Asia, the decline shouldn’t be ignored. Like a falling barometer, sliding commodity prices can often signal an approaching storm. Over the past four sessions, nearby Nymex crude oil futures plunged over $7 a barrel, or 12%, to $52.33, the lowest since mid-April. Copper, the metal with a putative Ph.D. in economics, took a 3.6% hit Tuesday and was off 7% in the past three sessions to a 52-week low of $2.4510 a pound, while Freeport-McMoRan fell a similar amount and hovered just above the 52-week high touched in January. Iron ore entered a bear market, losing 20% since its June 11 high, according to Bloomberg, while aluminum, lead and platinum also slumped. Grains and soybeans also took a tumble, so it wasn’t just industrial commodities getting hit. These declines suggest a broader deflationary trend, which was corroborated by gold’s renewed slide after barely treading water despite the heightened fear and uncertainty that historically has helped the precious metal. As I have argued in these columns previously, gold is more a currency than a commodity, and its value depends on the public’s perception of paper money. Illiquidity heightens demand for currencies (to pay back loans, for instance) and raises their value relative to gold, depressing the metal’s price. Regardless of the reason, the SPDR Gold Shares exchange-traded fund shed another 1% Tuesday to trade about 1% above its 52-week low while the Market Vectors Gold Miners ETF tumbled 3.9% to about 4% from its 52-week low. And silver fell to a five-year low Tuesday, settling at $14.969 a troy ounce. The iShares Silver Trust ETF sank 3.7% to close at $14.43 after falling to as low as $14.03. Although it’s impossible to pinpoint the source of the deflationary winds, there is little question about the direction they’re blowing. While the media’s attention has been concentrated on Greece, Renee Haugerud, who heads the commodity-oriented Galtere hedge-fund group, has been feeling folks have been looking at the wrong places. While she admits that there are no data to back up her “gut” feel, it appears the selling of commodities is related to China’s stock rout. But Haugerud is quick to dismiss market rumors that China’s authorities are dumping commodities to pump cash into its stock market. More likely, she says, traders who have gotten hurt by the slide in Chinese stocks may have had to liquidate other assets, such as commodities, to meet margin calls. That’s been exacerbated by suspension of trading in hundreds of stock, some 162 issues in Shanghai and 514 in the even more speculative Shenzhen market. When you need cash, you sell what you can, not what you want to sell. Moreover, she continues, commodities provided the collateral for loans to fund other activities, including stock purchases. Crude oil, copper and, to a lesser extent, soybeans have been liquidated to pay back those loans. That process is perhaps three-quarters over, Haugerud adds. There also are fundamental reasons for agricultural prices to fall. 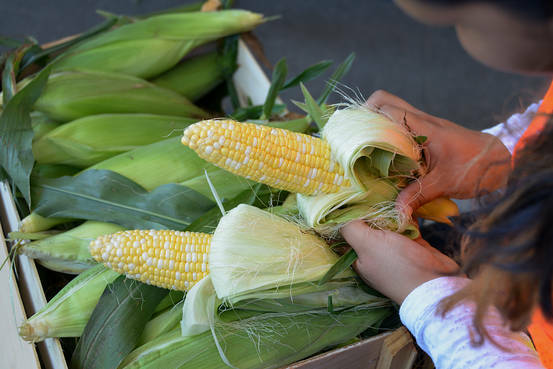 As a proud Midwestern farmer’s daughter, she monitors the crops from a working farm in the heartland, and she sees a bumper crop for corn this year. Ample supplies of grains and soybeans are pressuring their prices, which is about as straightforward as markets get. 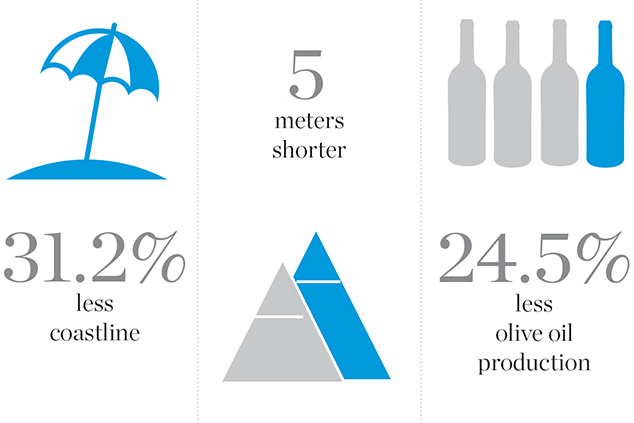 The deflationary impact from Greece is less simple. Charles Gave, whose name forms the first half of Gavekal Dragonomics, suggests that a Grexit would exert deflationary pressures—in contrast to the inflation that has historically followed a currency devaluation, which would be the effect of a reintroduction of the drachma. As Gave explains in a note to clients, 75% of Greece’s 315 billion euros of foreign debts is owned by public institutions—the International Monetary Fund, the European Central Bank and various European Union groups. A write-down of that debt would have deflation impacts. A 50% write-down in the Greek debt would “dent” the IMF’s capital, which would not likely to be topped up by the U.S., the largest shareholder in the Fund. That would curtail the IMF’s ability to intervene in future crises—which would be highly deflationary, according to Gave. Also facing a big hit to capital would be the ECB, which is owned by the EU central banks. Gave imagines the Bundesbank wouldn’t pump in additional German taxpayer funds into the ECB, which would violate Germany’s constitution. That constraint also would be highly deflationary in restricting the ECB’s lending. Finally, Gave writes: “The alphabet soup of institutions and lending programs created by those ever-so-smart Eurocrats to help finance Greece all amount to the same thing: these entities are highly rated by the big ratings agencies and have issued lots of bonds bought by the world’s major financial institutions. Unfortunately their assets are mostly parked in Greek paper, with a small amount of Spanish and Portuguese bonds thrown in for good measure.” That’s analogous to Fannie Mae and Freddie Mac, the big U.S. mortgage agencies’ implied federal guarantee. If European governments are forced to recognize their holdings of Greek obligations as part of their own debt by credit agencies, they may “clamor for more tax hikes and government spending cuts”—also deflationary. All of which is admittedly speculative. What is clear is that neither the Greece crisis nor China’s stock slide is positive for the world economy. At a minimum, commodities’ signal is consistent with that. The chancellor, sitting a few steps away with a blank expression on her face, scrolled through her smartphone. Ms. Merkel’s power after a decade in office has become seemingly untouchable, both within Germany and across Europe. But with the “no” vote in Sunday’s Greek referendum on bailout terms posing the biggest challenge yet to decades of European integration, risks to the European project resulting from Germany’s rise as the Continent’s most powerful country are becoming clear. On Friday, Spanish antiausterity leader Pablo Iglesias urged his countrymen: “We don’t want to be a German colony.” On Sunday, after Greece’s result became clear, Italian populist Beppe Grillo said, “Now Merkel and bankers will have food for thought.” On Monday, Ms. Merkel flew to Paris for crisis talks amid signs the French government was resisting Berlin’s hard line on Greece. Senior German officials, in private moments, marvel at the fact that their country, despite its weak military and inward-looking public, now has a greater impact on most European policy debates than Britain or France, and appears to wield more global influence than at any other time since World War II. Berlin think-tank elites, diplomats and mainstream politicians generally see the rise of German power as a good thing. They describe the stability, patience and rules-based discipline of today’s German governance as what Europe needs in these turbulent times. Germany—with its export-dependent economy and history-stained national identity—has the most to lose from an unraveling of European integration and is focused on keeping the union strong, they say. Ms. Merkel’s popularity at home has remained strong through the Greek crisis, holding about steady at 67% in a poll at the end of June. She now must weigh whether to offer additional carrots to Greece to keep the country in the euro and preserve the irreversibility of membership in the common currency—at the risk of political backlash at home and the ire of German fiscal hawks. Only 10% of Germans supported further concessions for Greece in another poll last week. U.S. officials generally see German leadership as crucial geopolitically, praising Ms. Merkel’s push last year to get all 28 European Union countries to adopt sanctions against Russia over Ukraine. But across Europe, Germany’s power is also straining unity in the EU, an alliance forged as a partnership of equals that now is struggling to accommodate the swelling dominance of one member. With every crisis in which Ms. Merkel acts as the Continent’s go-to problem solver, the message to many other Europeans is that for all the lip service about the common “European project,” it is the Germans and faceless bureaucrats in Brussels who run the show. The pushback against German power in Europe is likely to grow if the eurozone crisis worsens or if Berlin’s policies grow more assertive. In Greece last week, it was the stern face of 72-year-old German Finance Minister Wolfgang Schäuble that appeared on some of the posters urging voters to reject Europe’s bailout offer. “He’s been sucking your blood for five years—now tell him NO,” the posters said. Similar to America’s global role, German power polarizes Europe. Ms. Merkel is popular in the European mainstream, even as populist politicians say she is building a “Fourth Reich” dominated by German capitalism. 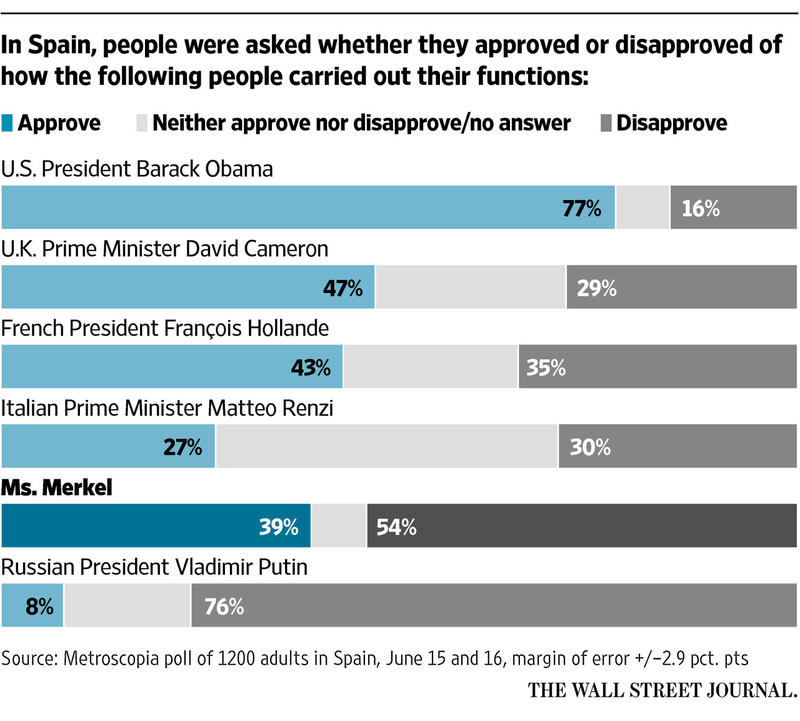 In Spain, for example, a June poll found Ms. Merkel to be the most disapproved-of foreign politician after Russian President Vladimir Putin, with 54% disapproval. But she also drew one of the higher approval ratings, 39%, besting the leaders of Italy, the European Commission and the United Nations. The dynamics are similar in France. While more than half of French in a poll last week disapproved of Ms. Merkel’s handling of the Greek crisis, two-thirds of adherents of the main center-right party approved. Now Greece presents the most direct test for Ms. Merkel’s Europe. Her government played the biggest role in shaping the austerity-and-reforms conditions for eurozone bailouts and was the most influential voice resisting debt relief for Greece. After Greece asked for a bailout in 2010, the heads of the European Central Bank and the International Monetary Fund traveled to Berlin to exhort German lawmakers to approve one. A year later, Ms. Merkel pushed for rules establishing greater fiscal rigor across the eurozone. In Spain, the press dubbed her la inspectora. Last September, then-Greek Prime Minister Antonis Samaras flew to Berlin and appealed to Ms. Merkel. Unpopular economic measures Greece was required under bailout terms to enact—including changes to pensions and taxation as well as the rules involving labor, banks and the public payroll—were feeding the rise of a radical left-wing movement, Syriza, he said. 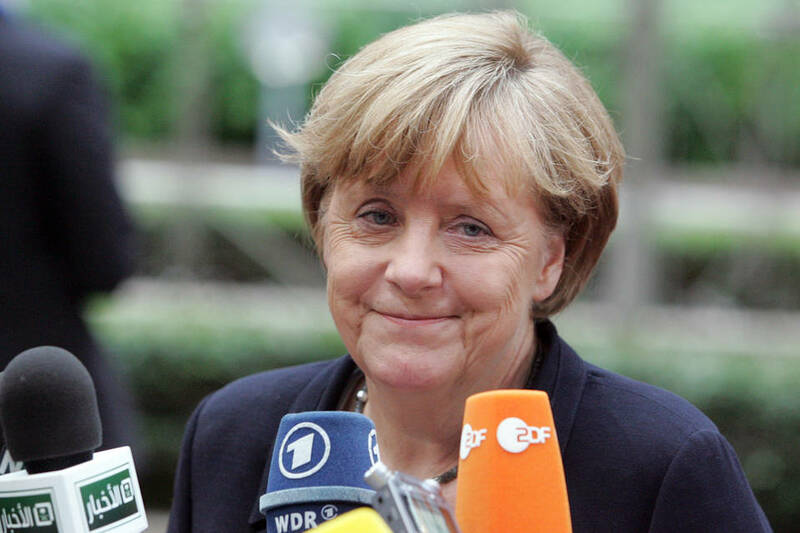 Ms. Merkel held firm and pushed back against offering debt relief. German officials advised the Greeks to tackle tough reforms right away. Mr. Samaras, amid rising Greek anger over economically stifling austerity measures, lost the election to Syriza leader Alexis Tsipras in January. As the crisis intensified under the new government’s tougher negotiating style, German influence grew even more unmistakable. In February, just hours after Athens sent eurozone finance ministers a letter asking for an extension of its aid program—and before the ministers had the chance to consult one another on it—the German Finance Ministry emailed reporters a brief statement. “The letter from Athens is not a substantive proposal,” it said, quickly stifling discussion of the letter. Early last week, while some European officials including French President François Hollande publicly held out hope of a deal before Sunday’s referendum, Ms. Merkel quickly signaled there would be no talks before the vote. Her view prevailed. For several decades, it was the roughly equal tandem of France and Germany that together called the shots on European policy. Because they often disagreed, their compromises typically ended up as palatable to the rest of Europe. Then a string of developments—including widespread opposition to the Iraq war, former Chancellor Gerhard Schröder’s 2003 market-friendly economic reforms and the taboo-breaking summer of flag-waving when Germany hosted the 2006 World Cup—started to instill a more confident sense of national identity in a country still living in the shadow of the Nazi era. Economic problems in France weakened the country on the European stage, while British politics grew increasingly inward-looking. In November 2011, Ms. Merkel’s Christian Democrats gathered on the grounds of the centuries-old Leipzig Trade Fair in eastern Germany for an annual party convention and remarked on Germany’s new influence. It had been just over a year since Greece asked for its first bailout. Some Europeans, including the French, initially resisted pushing for heavy doses of austerity in exchange for aid. But Ms. Merkel—the former physicist who grew up under communism and now oversaw Europe’s largest economy—had won the argument. Ms. Merkel’s approval rating at home shot up, from around 40% in 2010 to 70% in 2013, a range where it has remained. A yearslong refrain from German politicians helped keep German voters behind Ms. Merkel even as it estranged Europeans elsewhere: Countries seeking help must also do their Hausaufgaben—their homework. In March 2014, Ms. Merkel put her domestic political capital on the line and established Germany as a key European geopolitical power: She took on Mr. Putin. With him on the verge of annexing Crimea, the typically soft-spoken chancellor warned that Russia faced “massive damage,” economically and politically, if it continued intervening in Ukraine. In ensuing months, Ms. Merkel repeatedly secured unanimity among EU members for rounds of Russia sanctions. Her surprisingly tough line unsettled a pacifist German public that polls show shrinks from foreign-policy involvement and wants a good relationship with its former World War II enemy. And, as it had at the peak of the eurozone crisis, the German-inspired consensus hid further strains on European unity. 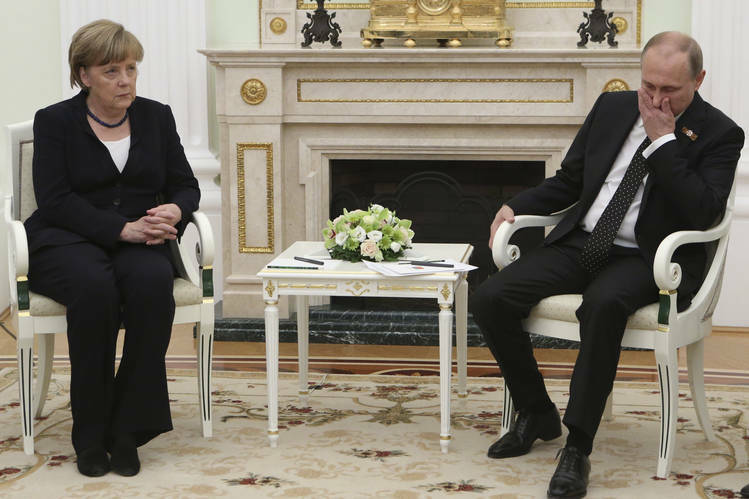 On the EU’s eastern periphery, Germany’s leadership on Ukraine stirred discomfort. Even as Berlin pushed for sanctions, it urged hawkish Western diplomats to avoid provoking Russia by such steps as stationing more NATO troops closer to Russia. Poland and the Baltic states said troops were needed for their security. The dispute over how to deal with Russia prompted a senior Polish official to exclaim, in one meeting last summer, that Germany was again toying with Poland’s existence—alluding in part to the 1939 Nazi-Soviet nonaggression pact that effectively divided Poland between Russia and Germany. Other countries, from Italy to Hungary, have chafed at having to put their close ties to Russia on ice amid Ms. Merkel’s push for sanctions. In France, Berlin’s shaping of the crisis response has spawned bitter criticism of Germany, now a popular theme for far-left and far-right alike in a country whose influence used to exceed its neighbors’. In a French poll last December, 74% said Germany had too much sway in European Union politics. With the crisis in Greece worsening, cracks have started to show in the mainstream. Mr. Hollande, a Socialist, faces a domestic rebellion from members of his parliamentary majority who say he has signed up to German-inspired austerity and abandoned his 2012 election pledge to push pro-growth policies in Europe. Last week, he called on Greece’s creditors to try to reach a solution more quickly. In March, a prominent Berlin political scientist, Herfried Münkler, published a book, “The Power in the Middle,” that captured the German elite’s foreign-policy Zeitgeist. Germany, he wrote, had the duty to lead Europe because neither Brussels nor another EU country was strong enough to do so. But in an interview last week, Mr. Münkler said Germany leading Europe alone was “no long-term solution.” For one thing, polls continue to show Germans don’t want more international responsibility. For another, he said, the potential rise of a successful populist party in Germany—as has happened in just about all of Germany’s neighbors, from Poland to the Netherlands to France—would sharpen nationalist rhetoric in Germany and increase Europeans’ aversion to German leadership. “Germany is in this hegemonic role in Europe because we have no relevant right-wing populist parties,” Mr. Münkler said. What Would the Eurozone Look Like Without Greece? That is why Europe’s current showdown with Greece is critical for the future of Germany’s place in Europe, analysts say. If Ms. Merkel approves a new lifeline for Athens after weeks of vitriolic debate, she is likely to face a furor from Germany’s right and stoke the country’s incipient euroskeptic movement. If Greece careens out of the euro, Ms. Merkel will face blame for an episode that has further polarized Europe at a time when controversies over the U.K.’s EU membership and how to treat migrants and refugees are adding to the tensions wrought by the Ukraine crisis. —Matt Moffett, Giovanni Legorano and David Román contributed to this article.